In the ever changing Healthcare market, our understanding of HTM 64 & 62 enables us to offer advice and solutions on products and panel systems to suit your budgetary & programme requirements. 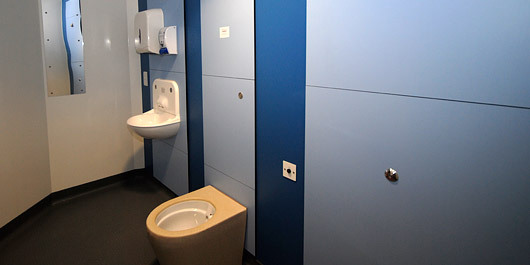 Shire were appointed as a subcontractor to install the IPS Panelling and the loose items of sanitaryware, at both the Royal London Hospital and at St Barts Hospital. 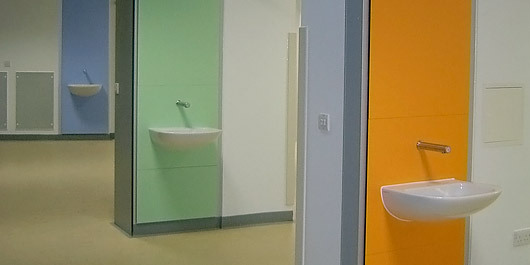 Shire were appointed as a subcontractor to install the IPS Panelling and the loose items of sanitaryware, at both the Royal London Hospital and the St Barts Hospital. Both projects were managed by Skanska Construction and were installed concurrently, with Shire providing an on-site management team for both projects. This involved working closely with Venesta Washrooms Ltd on the liaising with site dimensions, sequence of deliveries and off-site storage of the removable panels, including the co-ordination of such deliveries to match the programme laid down by Skanska Construction. The two projects combined totalled £ 2.2million worth of turnover for Shire (labour only), with the material purchase added to this value, would result in a total supply and fit figure of £ 6.5million. The programme of works has seen Shire on site with a permanent management team for over three years. The work content involved Shire not only installing the IPS panels, but also undertaking the final connections of hot / cold and waste pipework, including the phenolic lagging of the pipework. All works were then flush tested and commissioned prior to the final fix panels being fixed into place. At the Royal London Hospital, the project was split down into three main towers. Shire had a management structure on site that involved an overall project manager, then a sub-manager that was responsible for each tower. Within this team, a Supervisor then had the overall responsibility for the labour out on site. This enabled the project to be attacked with a co-ordinated approach, with a clear chain of responsibility from the Skanska floor manager, right down to the Shire team supervisor. All works were fully tested and commissioned, including the preparation of full sign off documentation and snag rectification. For further information on any of our projects, please contact us. Part of the Designed for Life programme of Welsh Health Redevelopment, Ystrad Mynach benefited from a new 220 bedroom hospital, built by Bristol based BAM Construction. 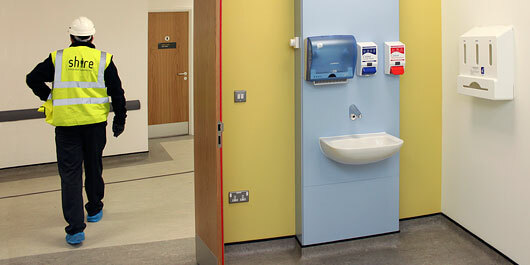 Shire were approached to take on the hospital panelling, sanitaryware and final plumbing connections of all the sanitaryware items throughout the hospital. BAM Construction wanted a quality system, that could be part compiled off site with the added benefits of factory conditions. Shire came up with a scheme that not only provided this, but also worked within the tight budgets that BAM had to achieve. 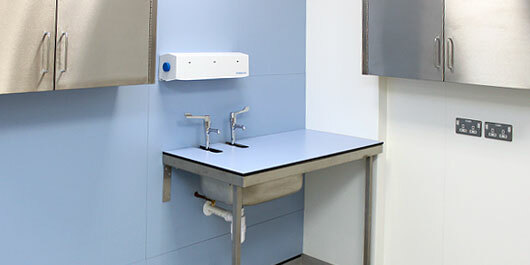 Shire appointed Bushboard Washrooms to manufacture the core panels and flashgap, along with pre-made boxed out units for the clinical washbasins. Solid grade duct panels with wide solid grade flashgap system, fitted with Dart Valley anti ligature sanitaryware within the Mental Health Suite. Typical Clinical Wasbasin set up, on a premade boxed out unit fitted with an Armitage Shanks sensor spout. A typical Slop Hopper set up mounted onto removable HPL duct panels. A typical ensuite set up, showing solid grade duct panels with wide flashgaps, fitted with Armitage Shanks wall mounted extended WC pan and anti ligature sensor spout. 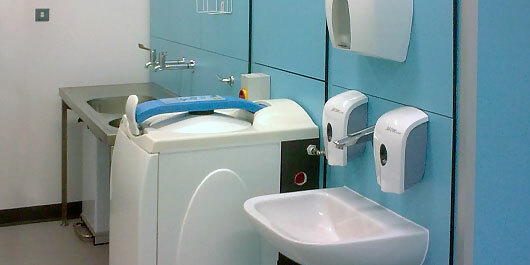 A typical disabled wash hand basin fitted within one of the ensuite facilities. To assist with the needs of BAM, Shire set up an off site assembly unit in Crumlin. From here, Shire took delivery of the Bushboard panels. The panels without sanitaryware, were labelled up and stored for fitting on site at a later date. The panels that required sanitaryware were mounted onto a plywood subframe, fitted, tested and mastic sealed. Units were connected by Shire. Final testing & commissioning undertaken in line with BAM's commissioning programme. 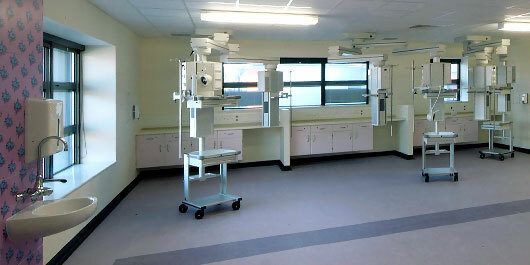 As part of the redevelopment of Prince Charles Hospital, Laing O'Rourke took on the project of refurbishing and extending the existing Accident and Emergency Unit, with the addition of a Day Surgery Unit to the first floor. 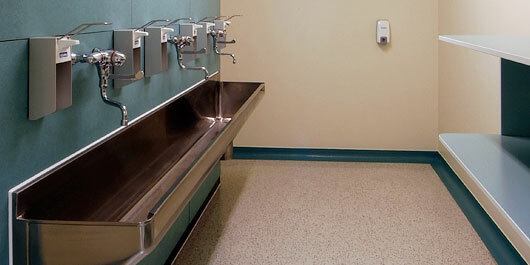 The Emergency Decontamination unit fitted with a multitude of basins and shower facilities all mounted onto solid grade removable duct panels. 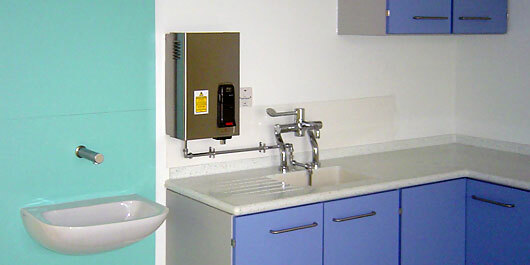 A typical Clinical washbasin fitted to a pre-made boxed out units and supplied with an Armitage Shanks Sensor tap. HPL duct panels fitted with a stainless steel Doon sink with supporting legs. 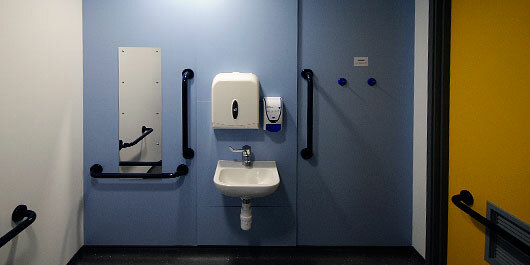 A typical disabled washroom adjacent the main wards, fitted with the usual Document M sanitaryware and brassware. 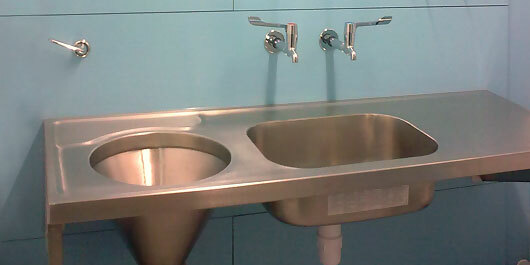 A typical panel mounted Janitorial Unit and Doon stainless steel sink set up, fitted to removable HPL duct panels. Shire were appointed to undertake the panelling and sanitaryware works to the project. 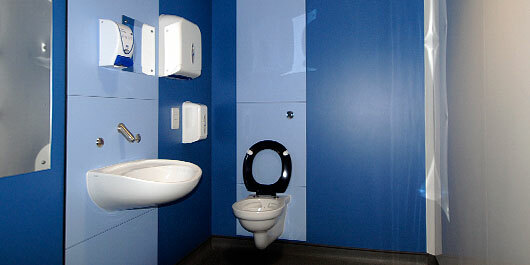 This involved using Bushboard Washroom's panel system, combined with pre-made boxed units by Paneltec Manufacturing. 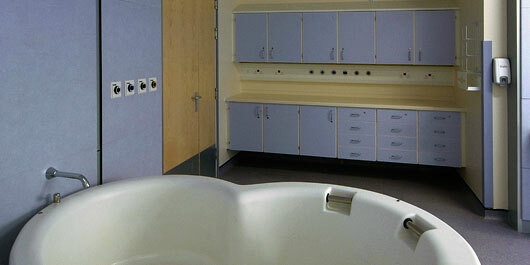 A number of the ward areas also benefited from ensuite facilities, which were made from Solid Grade Laminate. 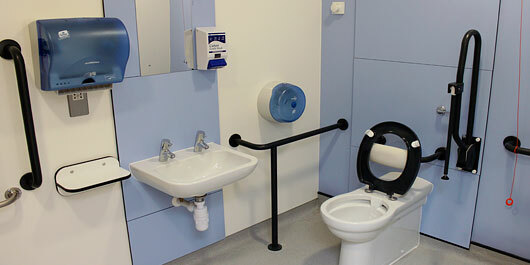 All areas were fitted using Armitage Shanks clinical sanitaryware, to normal hospital standards. These consisted of the panel mounted Sensorflow 21 spout's, which we programmed for specific run times, and 24 hour anti-legionella flushing. Shire were also asked to provide within the Endoscopy area of the Day Surgery Unit, a bespoke stainless steel endoscopy unit, fitted with provisions for the various scope cleaning equipment that the hospital were providing. 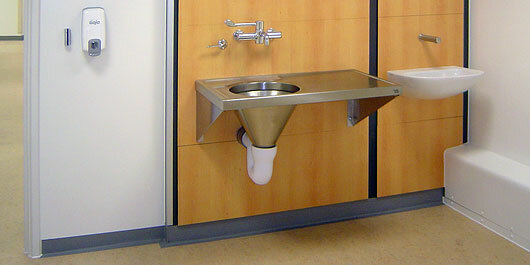 A typical clinical washbasin set up, fitted to a pre-assembled boxed out unit. Fitted with a Contour 21 washbasin and sensor tap. A standard Armitage Shanks Slop Hopper unit fitted to a set of removable HPL duct panels. 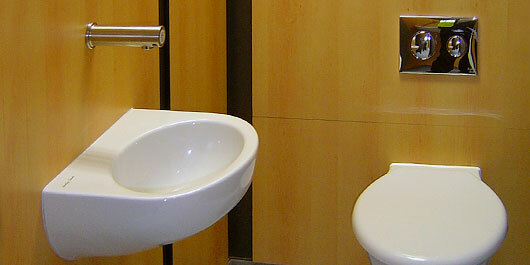 A typical clinical washbasin unit fitted with a sensor spout. A small WC set up, with panel mounted cloakroom style basin fitted with a Dart Valley short projection sensor spout. 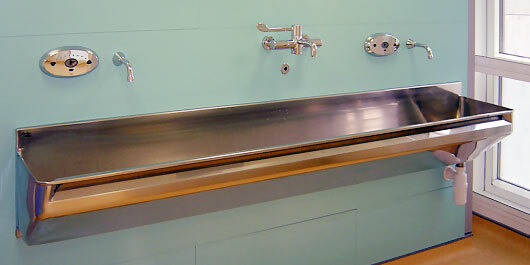 A surgeons scrub up trough, fitted with a combination of tap fittings by Armitage Shanks Markwik and Rada Sense. 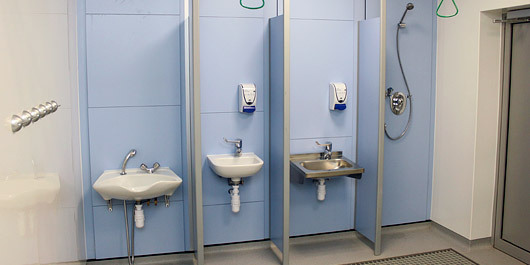 BAM Construction undertook a number of projects at Southampton General Hospital over a 5 year period, employing Shire to undertake all of the IPS Evolve panelling systems, provided by Venesta Washrooms. One of the projects that we completed was the fit out of the Paediatrics department. This utilised the speed and efficiency of the pre-plumbed Venesta panelling system (fitted off site with sanitaryware), along with final plumbing connections on site provided by Shire. Shire also provided, within certain rooms, the Horne Optitherm panel mounted taps, a tap which can provide blended hot and standard cold water. A typical ward, (Disabled) install, with standard Doc M fittings, along with a shower in a box by Armitage Shanks. Pre-hung & pre-plumbed panels from Venesta Washrooms. A typical Slop Hopper unit mounted to a set of HPL panels, all pre-plumbed off site. 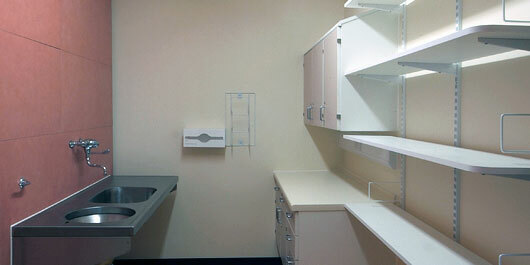 View of a typical Dirty Utility room, fitted with a clinical washbasin, slop hopper unit and a macerator provided by Vernacare. 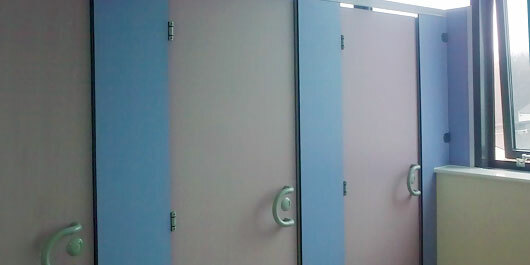 Venesta Quantum Resista cubicles all fitted with outward opening doors and specialist 'd' handles. 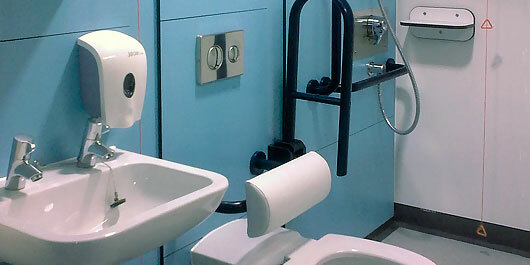 A typical clinical washbasin set up, fitted with an Armitage Shanks sensor spout tap. All units were supplied pre-plumbed and delivered to the site. Shire were appointed by Cowlin Construction to undertake the installation of the IPS panelling and loose sanitaryware on this prestigious project at the University Hospital at Heath Park in Cardiff. The project was challenging, in that it was split into 5 phases of work, spread over 2.5 years. It also posed the usual challenges of working within an existing building, trying to fit new build material around existing service provisions. The work consisted of IPS Evolve pre-plumbed units, provided by Venesta Washrooms, along with loose items of Armitage Shanks sanitaryware. 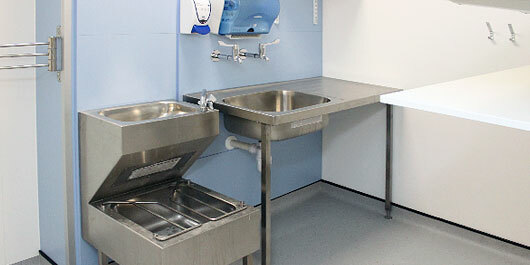 The usual installation of HTM sanitaryware was included, namely; slop hoppers, scrub trough's, janitorial units, clinical basins and clinical WC pans. Each tap fitted was a programmable unit by Armitage Shanks, which allowed individual user settings to be defined, and provision of a 24 hour anti-legionella flushing cycle. 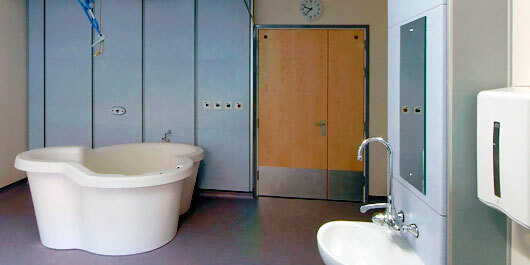 One of the main birthing suites at the unit, supplied and fitted by Shire with an Active Birthing Pool and Rada Sense bath filler. One of the children's theatre, fitted with a clinical washbasin mounted onto 'Bird' screen printed laminate panels. A typical Dirty Utility room fitted with a pre-plumbed slop hopper unit onto standard HPL duct panels. A close up of the Active Birthing pool. 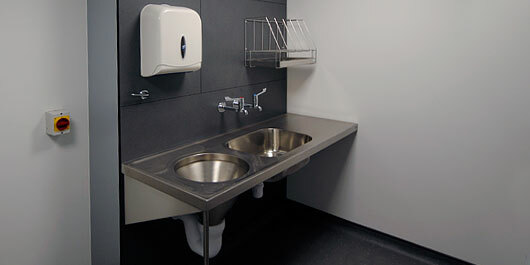 A typical surgeons scrub up trough, pre-plumbed and mounted to the panels off site by Venesta Washrooms. BAM Construction were appointed to construct the new Maternity Unit at Wonford in Exeter. The unit consisted of 60 bedrooms, that were each fitted with a clinical boxed out washbasin unit, and ensuite facilities. 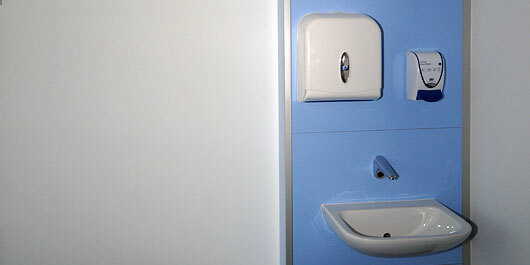 Shire were appointed to provide a panel and sanitaryware solution, so turned to Venesta Washrooms. 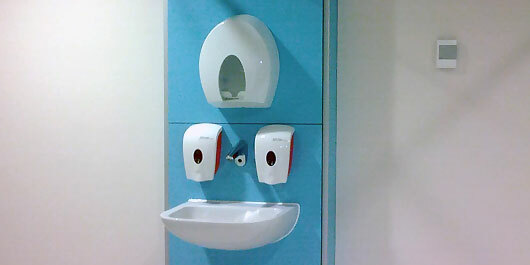 The work consisted of a typical HTM installation, with pre-plumbed IPS Evolve units complete with sanitaryware. Shire also undertook the final 500mm plumbing connections from valves left by others, up to our appliance. Commissioning and testing were also completed, along with a typical QA procedure provided by BAM Construction. Several of the wards were fitted out with birthing pools, again provided by Shire. These were fitted with RADA Sense electronic spout taps, for specific temperature control of the water contained within each of the birthing pools.